Its getting warmer and warmer every day... and its just the first day of April! I am seriously dreading the onslaught of a reaally HOT summer in the days to come. And believe me, the sun is relentless here in the deserts. Oh well, as we cant really run away from where we are living for the moment, we try to make our lives easier in other ways. 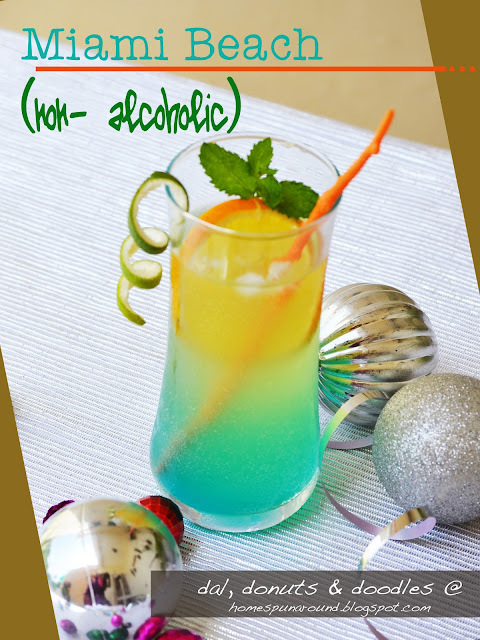 And of course this really pretty drink when you want to throw a party and WOW the guests! This was a showstopper in our Sea-Themed Party that we had last year and I had promised to put up the drink recipe on my blog ASAP. Now this is the recipe for just one glass, so its easier to understand. 3- Pour in the lemon drink so it fills the glass. and let the Blue Caracao float all the way to the bottom, leaving a beautiful gradient behind. 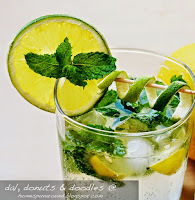 5- Dont stir it, just garnish with fruits, or lemon peel, slice of lemon and mint and serve at once. I definitely dream about going to this party place again. The live music at venue New York was an added bonus, providing a backdrop for the fun hours spent imbibing, tasting, and chatting up with the breweries and beer distributors.